As five stagings of ‘Uncle Vanya’ hit UK theatres in a few months, why does its existential gloom speak to us so profoundly? In a rehearsal space in east London the actor Ken Stott is poking disconsolately at the contents of a Tupperware box. It’s his lunch and he is clearly on a diet that is affording him no fun. “You won’t be able to see me by Monday,” he observes, gloomily. Stott is in good company: his Vanya will be one of five to grace British theatres within a few months. Indeed the production, directed by Lindsay Posner, opens in the West End within days of a Russian-language performance by Moscow’s Vakhtangov company, directed by the renowned Rimas Tuminas, with leading Russian actor Sergey Makovetsky in the title role. So why is this self-styled “cantankerous old codger” so much in the spotlight? Is it a coincidence? Or is there something in his grumpiness, self-mockery and frustration that speaks particularly to our time? And if so, why should that be? 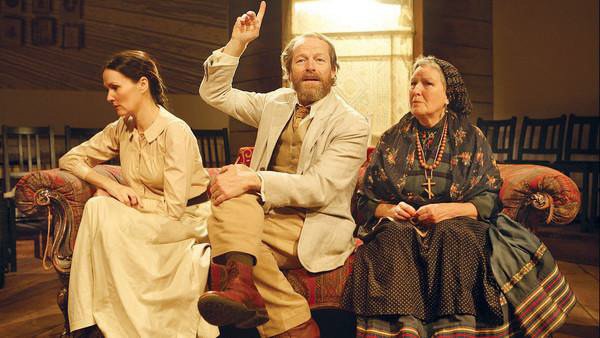 Chekhov’s Uncle Vanya is a masterpiece: a humane, funny and heartbreaking study of wasted potential. But boil it down and you end up with something as dull-sounding as suet pudding. It opens on a run-down rural estate painstakingly maintained by Vanya and his niece Sonya. We first meet the local doctor, Astrov, complaining about the tedium of provincial life, and then encounter Vanya who, at 47, is undergoing a mid-life crisis of epic proportions, kick-started by the arrival of his brother-in-law, a pompous professor, and his beautiful wife. Nearly everyone feels sorry for themselves – particularly Vanya. So why do we warm to him so? Vanya’s crisis is specific: he has spent his life maintaining the estate in order to support the professor’s career. But when the tetchy academic arrives in person, Vanya suddenly feels a fool. He senses that he has wasted 25 years servicing an opinionated charlatan. Iain Glen, who played Vanya this spring, suggests that his predicament, though particular, is universally recognisable. What is also important is the fact that this introspection strikes at a moment of enforced indolence. Like most of us, Chekhov’s characters start to brood when they are tipped out of their normal work routine. But while the frustration may be general, it is Vanya who is singled out in the title – and as “Uncle” Vanya. It’s an affectionate appellation, but not one designed to confer heroic status. It draws attention to the unfulfilled potential in his life: Vanya is not a father, grandfather, husband or lover. But does the play’s current popularity arise only from its timeless qualities? Or does this emotional tumult feel particularly pertinent for a 21st-century audience facing a precarious future and the loss of old certainties? Tuminas, director of the Vakhtangov’s Vanya, suggests that this might in part be true. “People nowadays are very desperate,” he says. Tuminas’s production is groundbreaking. Wildly physical, darkly comic and gleefully absurd, it dispenses with all the usual Chekhov furnishings. His characters rattle about on a near-empty stage, propelled by their feelings. “It’s a physical realisation that time is slipping through your fingers,” he says. The American Richard Alger is co-director of Theatre Movement Bazaar’s Anton’s Uncles, which toured Britain earlier this autumn. He too feels the resonance of the panic in Chekhov’s play. “I think the idea of not fulfilling your dreams is very big in the Zeitgeist,” Alger says. Anton’s Uncles strips down the original, emphasising its wild fluctuations of mood. “You’re left with something very raw and that’s what’s appealing about his work,” he says. In its earliest form, the play incorporated a suicide and a happier ending. But Chekhov changed this for a failed shooting and a more ambivalent ending: Vanya and Sonya return to their labours in a final scene that contains both solace and aching sadness. His characters may despair, but in the end they keep on keeping on. Less dramatic, perhaps, but far truer to most people’s experience.